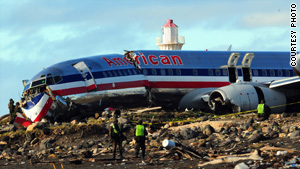 On December 22, an American Airlines Boeing 737 overran a runway in Kingston, Jamaica, injuring 91 passengers. Washington (CNN) -- The FAA said Friday it is heightening scrutiny of American Airlines after the carrier had three landings go wrong in December. "In situations where there may be several incidents involving a single carrier over a short period of time, FAA inspectors increase their oversight, which we're doing now," FAA spokesman Lynn Lunsford said. The review was prompted by the botched landings of three planes between December 13 and December 24. In the December 13 incident, an MD-80 landing at Charlotte Douglas International Airport in North Carolina touched down and went off the left side of the runway. While trying to get back onto the runway, the plane's right wingtip touched the ground. On December 22, a Boeing 737 overran a runway amid heavy rain at Norman Manley International Airport in Kingston, Jamaica, injuring 91 passengers. And on December 24, an MD-80 en route from Chicago, Illinois, struck a wingtip landing in Austin, Texas. Billy Sanez, a spokesman for American, told CNN Friday that the airline is cooperating with the investigation, which he said was routine in landing incidents. Lunsford said the review will help determine whether the botched landings "might be indicative of a larger issue." If so, he said "the FAA communicates its findings to the air carrier and assists in the development of the appropriate corrective action." CNN's Mike Ahlers and Dave Alsup contributed to this report.